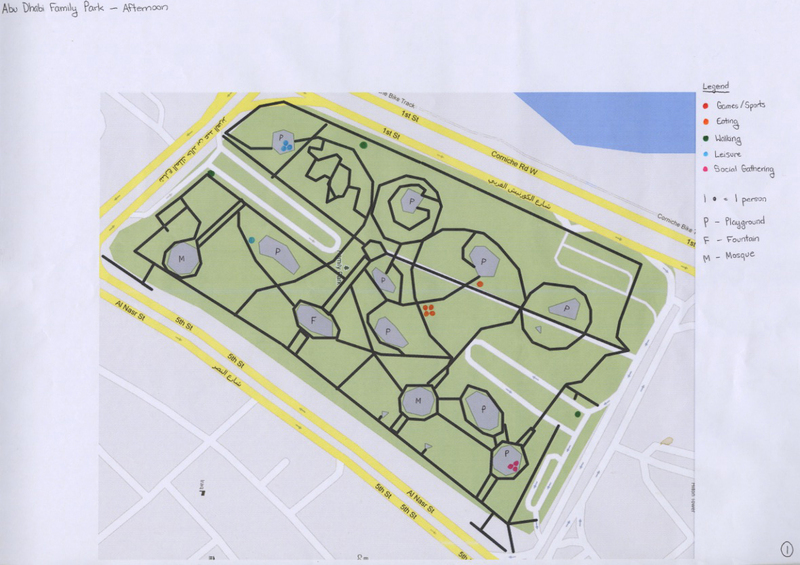 We continue our progression on unorthodox maps of Abu Dhabi. Check out part one here. While the maps in the first series focused on physical spaces, the material things they contain, and the transactions that happen within them, this second set of maps takes a slightly different approach to concentrate on the people that occupy these spaces. Though allocation of space plays a significant role in shaping any urban environment, it is always important to think about the people who inhabit this environment when venturing to represent it. How could you describe New York City, for example, without the flow of people in and out of the subways, without the buskers on the street, or without the teeming masses in Times Square? How could Paris be painted without the chaos of traffic around the Arc de Triomphe, or the crowds browsing the bouquinistes along the Seine? What is Buenos Aires without the Argentine street tango, Tokyo without its Harajuku girls, or Mumbai without its many vendors hawking spicy chaat and syrupy sweets? Abu Dhabi, similarly, is more than just its architecture. The flow of people through Abu Dhabi’s urban landscape is what brings it to life, and though the traffic patterns can change, the movement persists. The maps of the Family Park, near the Corniche, record the people and activities observed there, showing the fluctuations in the demographic usage of this public space. This mapping process, unlike a more “objective” map, captures some of the lived experience of the park at various times of day. At some points during the day, the park lived up to its name, and there were many families engaged in leisure activity and sport; at other times, it was largely empty or occupied primarily by individuals. 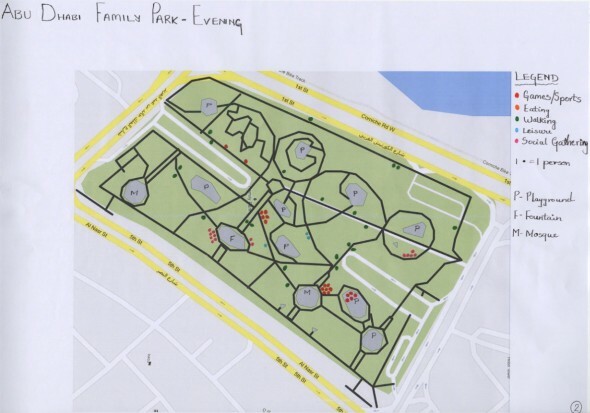 This map shows the ways in which this “family park,” regardless of its official name, is appropriated and domesticated to fit the needs of the surrounding community. By representing Abu Dhabi, or aspects of it, in unconventional ways, these maps lend meaning to the metropolis. Though they may not be as typically “accurate” as something like Google Maps, they speak to the feeling of a briefly lived experience, looking beyond scientific exactitude and official designations to find meaningful patterns hidden within the urban space. Have you mapped the aromas of Abu Dhabi yet?